In Edinburgh, we'll be staying for 3 nights at the Principal Hotel. Located in the upscale New Town, on George Street, rich in history and with plenty of local charm. 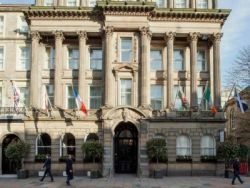 The hotel, with its distinctive façade, has been welcoming guests since 1881, and at its heart are five Georgian townhouses, built in 1775 as homes for Edinburgh’s prosperous citizens. The hotel’s architecturally-designed interior has a sense of restored grandeur with exquisite detailing and luxurious materials: oak, marble and leather in colors inspired by the 19th-century Scottish landscape painters. The Printing Press restaurant serves seasonal Scottish produce, and room service is available. Each room has been fully refurbished and combines the Old World splendor with intuitive technology, such as superfast Wi-Fi, flat-screen TV, stylish lighting and thoughtful touches to aid in a relaxing stay. Each sleek, modern bathroom is stocked with upscale amenities such as hair dryers, bathrobes and Anne Semonin toiletries. 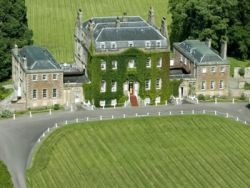 In Inverness, we'll be staying for 3 nights at the historical Culloden House Hotel. This elegant Georgian country house turned award-winning hotel sits on 40 acres of beautiful private grounds, once the lodging of Bonnie Prince Charlie during the Jacobite uprising of 1745 and now located close to such attractions as championship golf courses and National Trust treasures. Culloden House offers croquet on the lawn as well as a tennis court, sauna, four-acre walled garden, forest trails, and a sophisticated fine-dining restaurant with modern Scottish cuisine featuring fresh local produce. The 28 elegant en suite rooms are lavishly furnished with wooden furniture and luxurious bedding, boasting romantic luxury and modern comforts such as digital TVs, trouser presses, hairdryers, and free Wi-Fi in addition to a turndown service and newspapers and magazines available in every room. 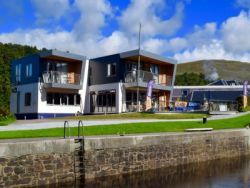 In Fort William, we'll be staying for 3 nights at The Moorings Hotel. Located on the banks of the Caledonian Canal, near the much photographed Neptune's Staircase locks, the hotel is also close to the Old Inverlochy Castle, Ben Nevis Distillery, the center of Fort William, and it offers the most spectacular views of Britain's highest mountain, Ben Nevis. The Moorings offers great services and amenities: free Wi-Fi, the fitness center, golf course access, a garden, newspapers and memorable dining experiences. In addition to the room service, there is a Bar, a modern Moorings Bistro and formal dining at Neptune's Restaurant serving a great selection of traditional and modern meals using the best of local fresh produce. Breakfast includes a European style buffet, followed by a full Scottish breakfast. The hotel has 32 tastefully furnished and individually designed rooms to capture the spirit of the Scottish Highlands. Rooms feature plasma screen TVs, hospitality trays, and private bathrooms with hairdryers and a selection of quality toiletries. Some rooms have a balcony or a terrace. We'll spend the last night in Scotland at the Holiday Inn Hotel at Glasgow Airport. 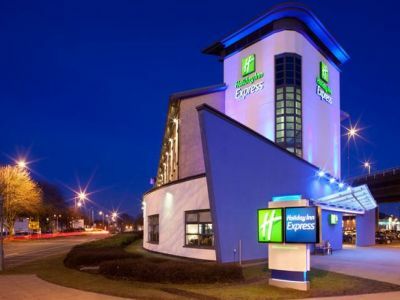 Located just a 2 minutes' walk from the terminal in Glasgow Airport, the hotel allows for easy access to your flight check-in if you're leaving early in the morning, and if you have some time before the flight back home, you can take a fast airport bus to Glasgow city center. The hotel's Great Room serves hot breakfasts as well as evening meals, and the dining options also include round-the-clock pizzas and a vending fridge for drinks and on-the-go snacks; you can also relax, play pool, and enjoy a drink at the on-site bar. The guest rooms include free Wi-Fi, tea/coffee making facilities, 32-inch flat screen TVs, a work desk, fully adjustable AC, and en-suite bathrooms with power showers and hair dryers.